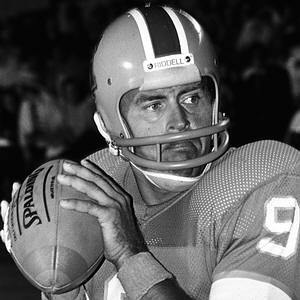 1974 Exact replica of number 9 Jim "King" Corcoran. Take time to read Jimmy Corcoran's Ball Boy experiences CLICK HERE with out question worth the read. Curtis, thank you for taking the time and effort to recreate my Fathers exact Philadelphia Bell helmet, you really did a great job! The last time I actually saw one in person was after the 5th game of the 1975 season when I carried it into the locker room after the Memphis Southmen game. 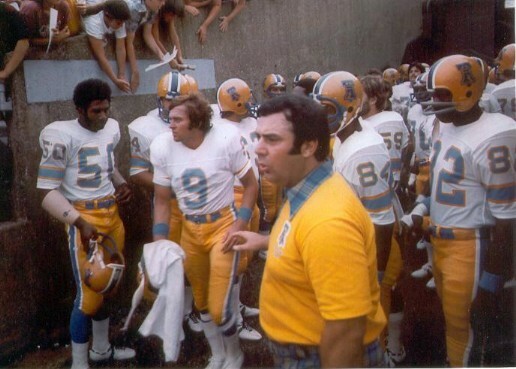 About a month later the whole league went under, and though he gave me his blue game jersey and T-shirt (he wore the same one in every game) I was never able to get the helmet. 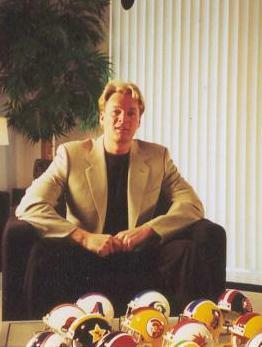 We heard that the helmets were the first things sold when they started to unload the equipment after the league folded. The detail is so exact, I would think it was the one he is wearing in all the WFL photos I have of him. 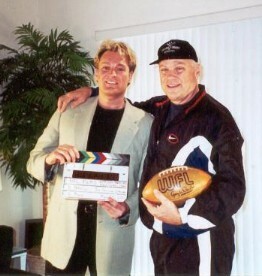 I'm just sorry that I didn't have it for NFL Films when they were at my house to interview me for the World Football League movie they are doing for ESPN classic. They filmed all of the equipment I had, it would have been a nice touch to have this helmet go along with the rest of my stuff. Thanks again for doing such a great job! Can you do the Pottstown Firebirds? Thank you, Jimmy Corcoran Jr.
Curtis, you weren't kidding when you said you could do the Pottstown Firebirds, great job! Your attention to detail was excellent, right down to the oversized number 9 on the back. 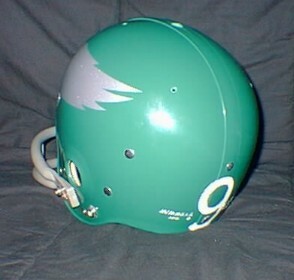 By the way that wasn't team issued on the Eagles helmets, it was added by the Firebirds once they acquired them from the Eagles. 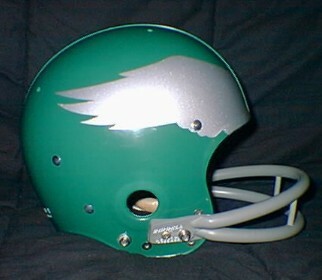 The Pottstown Firebirds were a minor league farm team of the Philadelphia Eagles that played in the old ACFL, they disbanded in early 1971. 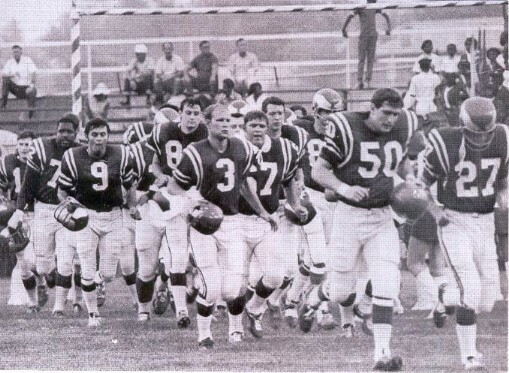 Most people would have forgotten all about the Firebirds if it wasn't for NFL films making two movies about them. 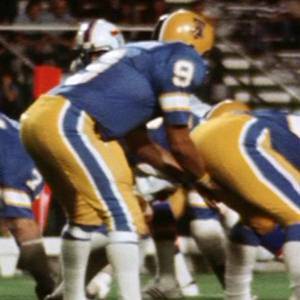 When I was in first grade living in New Jersey my father brought his Firebird helmet home for me to take to show and tell after he wore it the night before in a game against the Bridgeport Jets. The teacher asked if I would pass it around the class since none of the kids had ever seen a real pro football helmet before. After the first couple of kids passed it around no one wanted to touch it because the inside was still soaking wet from the game he had just played. This was before foam padding and the leather ear pads were still soaked inside. They also complained about how the helmet had a damp odor to it, I thought if you think that's bad spend some time in the Firebirds locker room where the whole place had a bad odor! That night he made me where it in Times Square, I couldn't see because it was covering my eyes. He basically used me as a billboard while he signed autographs in front of a movie theater. I never thought that someday I would be in a movie about the Firebirds or that I would have this helmet, thanks for everything! If interested in any of these or more WFL helmets please click on the photos below.